The busiest shopping day is no doubt Black Friday and this Black Friday, MAC cosmetics is coming out with a limited edition collection cleverly titled Grey Friday. The collection is sort of Twilight means makeup, very dark and mysterious. "Celebrate the busiest shopping day of the year with M·A·C Grey Friday, a color-coordinated Lipstick and Nail Lacquer duo in dark, sultry shades. 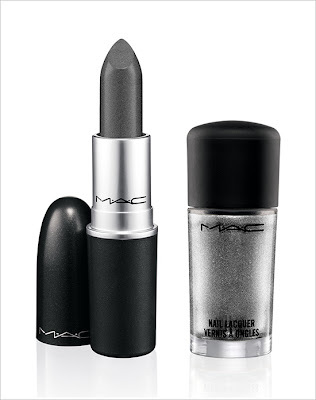 Featuring M·A·C Grey Friday Lipstick, a black-grey with silver shimmer, and M·A·C Grey Friday Nail Lacquer, with silver suede pearl. Available exclusively online for US eCommerce shoppers and M·A·C Times Square on Black Friday, November 23rd, only."